Unlike most of us, physicians spend their days (and many nights) immersed in issues of human life and death. How do those daily experiences that carry so much gravity affect the way doctors reflect on their own lives and shape their personal goals? 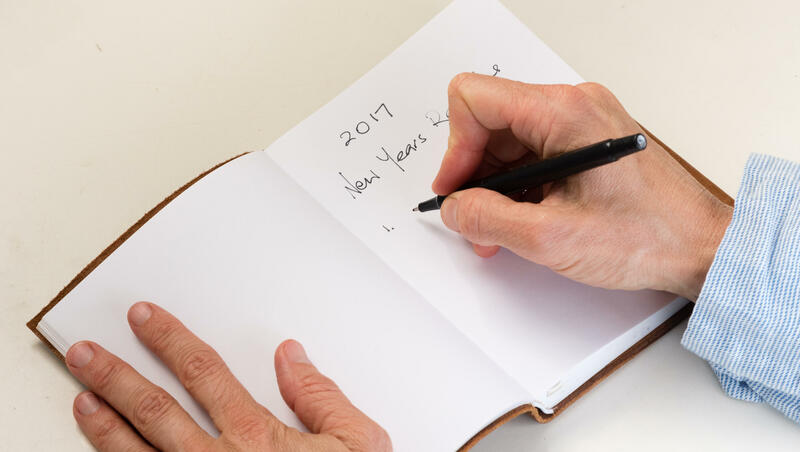 We asked some physicians around the country about their New Year’s resolutions for 2017. Resolutions ranged from calling parents more often and listening to their patients better to seeing more art or just the simple act of loving the people in their lives every day. Fitting meditation into the day was also a popular intention. And not surprisingly, many are inspired by their patients to live better lives. Shapiro has several New Year’s resolutions: to spend less time on screens, to finish a book she’s been writing, and to “listen more and assume less” when it comes to her patients, she said. She said cutting down on screen time may be the biggest challenge. “It helps the patient feel recognized,” she said, and often reveals important insights for their care. “I will make at least one person feel worthy every day. The reason: we are so busy trying to figure out how to live longer, be more connected, have cheaper energy, and faster everything, but if we do not build all this around the core of kindness, then none of our success will matter,” Sood said about his 2017 resolution. He said if people embrace kindness, everything else will follow. Smith hopes to better manage stress by practicing meditation. “While this is important for my mental well-being, as someone with a chronic pain condition, an autoimmune condition called ankylosing spondylitis, better stress management plays a significant role in minimizing pain as well,” he said. He hopes to incorporate at least 10 minutes of meditation into his daily routine at least five days a week. “This may amount to 10 minutes of deep breathing exercises, quiet time focused on quieting the mind, progressive muscle relaxation, or any number of meditation techniques. This will also have the secondary benefit of improving sleep, another healthy habit that I intend to work on in 2017,” Smith said. Gardner wanted to share her resolution from last year, in addition to her goal for 2017, because last year’s made such an impact on her life. She said she made a commitment to reach her goal: she forced herself to shut off digital screens earlier at night, turned down invitations that would keep her out too late, and scheduled naps before her night shifts. This year, Gardner’s resolution is to keep a journal. Goldstein said eating healthfully and exercising regularly are already a priority in his life, so he’s hoping in 2017 to add a few more health goals, including finding time to meditate every day, to get more sleep, to spend more time phone-free. “Definitely with the election and the crazy amount of anxiety everybody’s been experiencing because of it, and just generally the level of stress that comes from a job where you’re managing other people, managing a budget, and using your brain to think — I’ve started appreciating the importance of shutting off and breathing. “So some of my resolutions are connected, like getting enough sleep to function properly and turning off the phone connects with sleep, too,” Goldstein said. He also aims to connect more often with his family. “I probably talk to my siblings on a quarterly basis and my parents maybe every few weeks, at least once a month. I’d like to talk to my parents every week and talk with my siblings every month, to just stay connected,” he said. He said making time to fit meditation in a few minutes after the alarm goes off every morning “sets the tone for the day,” and taking a moment to breathe deeply as he’s walking to a meeting are little ways he’ll begin making changes. Another resolution: to explore more of Los Angeles’ cultural offerings in the coming year. He wants to check out the Los Angeles County Museum of Art, the Museum of Tolerance, the Hammer Museum, and more musical performance. “My wife and I, both ER doctors, are resolving to do more traveling this year. It’s what we like to do for fun, and what we used to do a lot more before having a baby two years ago. And after a few health scares and with some milestone birthdays coming up early in the year, why not now,” said Dark. “My New Year’s resolution is to make more time to nourish my spirit — to be in environments and with people doing things that make me feel good,” said Steinbaum. She said this year her patients have had a deep impact on her thoughts about how she plans to move forward into 2017. Steinbaum, a single mom, said up until now being a mother and her work have been her everything. Glatter said this year he didn’t wait for January 1st to begin his resolutions. Traveling to Brazil last summer as one of NBC’s physicians for the Summer Olympics inspired him to make changes right away. “I began a comprehensive diet and exercise program that began in Rio, and which I plan to continue through 2017. Being immersed in such a complex medical operation on a large scale provided inspiration to help me reset my priorities,” he said. As a busy ER doctor, he said he used to grab a muffin for breakfast and snack on chips and pretzels throughout the day. He’s ditched the calorie-dense foods for more fruits and vegetables, chicken, fish, nuts and nut butter. “The crazy lifestyle of the ER and rotating shifts leaves a tendency to have quick foods that are going to give you energy, but it’s quite to the contrary,” Glatter said. He’s also making more time for exercise — spinning, elliptical training and weights — and he hopes to meditate more in 2017. Nattiv said she’s also inspired by a Gandhi quote: “Be the change you want to see in the world,” and hopes to live by it a bit more this coming year. “So I’m terrible at New Year’s resolutions. Of course in the past I’ve done the usual — exercise four days a week, decrease chocolate intake, have more patience.” But a few weeks into the New Year, her old habits always seem to resurface, Attai said. This year, she said, “I haven’t had much time to breathe” or come up with personal resolutions for 2017, but she has thought about her goals for her patients.